There are lots of reasons that kids get cranky — just like us, they have bad days too. Some of the usual suspects are a lack of sleep, hunger, overstimulation, and the like. The easy fix for those times is to feed them and shuffle them off to bed. But what about when the crankiness goes on for days? Those times when your usually happy-go-lucky or laid-backed child turns into a grumpy, whiny, picky, sleepy, overstimulated bundle of emotions. A likely culprit for all that irritability is a cognitive leap or a growth spurt in the brain — a time when your child is working on a new skill under the surface, in the depths of the brain. Often, we think that growth spurts end sometime after toddlerhood but the truth is they continue throughout childhood. Brain growth spurts may not translate to inches in height. Under the surface, however, there is so much growth and change. The next time your child seems out of sorts, ask yourself — could it be a growth spurt? 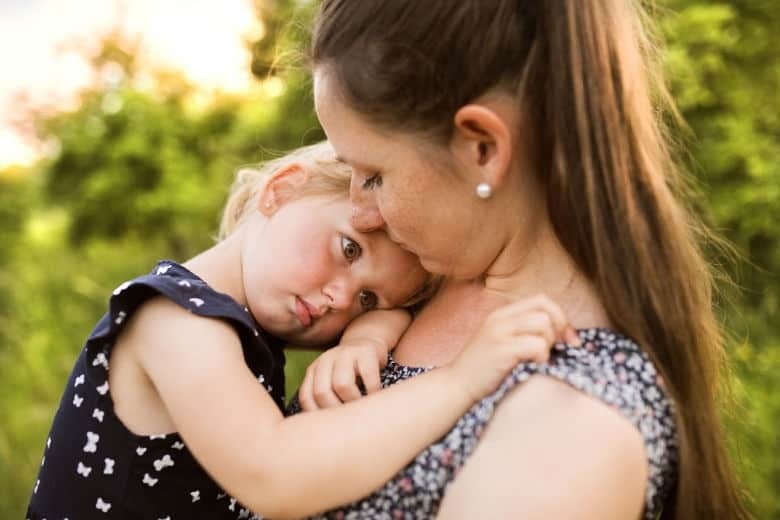 We are quick to blame a bad habit or behavior, but it could be that your child’s brain is changing at such a rapid pace that they are more easily overwhelmed and overstimulated. If so, then we can support that growth and remember that: This Too Shall Pass. This Too Shall Pass: What is a Cognitive Leap? Development rarely, if ever, follows a steady pace of upwards progress. Instead, it is characterized by leaps and spurts, gains and losses, regression and progression, and general disorganization. Before the new skill is learned and before the brain solidifies new connections, there is a period of relative chaos. After the new skill is mastered and the brain connections solidify equilibrium and your cheery child (and your sanity!) returns. When the brain goes through a growth spurt it is adding new connections and trimming unused ones. Have you ever noticed that when your child is learning a new skill that they practice it over and over? Practicing these new skills can almost seem like a compulsion. Like when a toddler plays the same scenario over and over and over again. Or when a preschooler starts repeating letter sounds all day. That kind of repetition is a sign that your child is in the midst of a brain growth spurt otherwise know as a cognitive leap. When the brain is practicing these news skills it is physically changing. New connections between brain fibers are growing, strengthening, or being trimmed away. During growth spurts, the brain is disorganized. New connections in the brain are more prone to misfiring and miscommunicating. Also, energy may be shifted from the parts of the brain that are not growing to the parts that are. How does this all affect your child’s behavior? In a word, they will be more cranky. 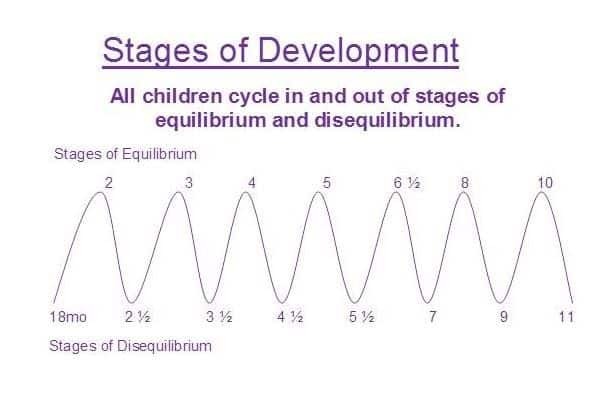 Developmental theorists believe that all children cycle in and out of periods of relative calm (equilibrium) and periods of relative chaos (disequilibrium). There is some evidence for this theory. 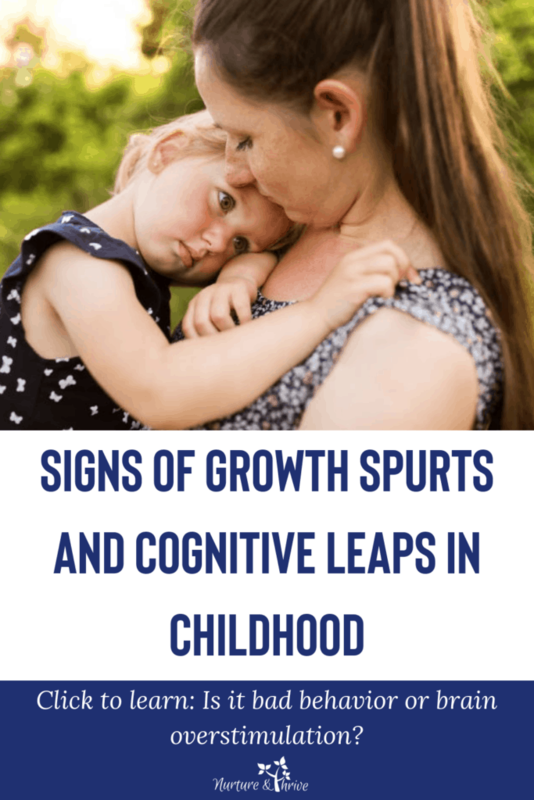 For example, growth spurt symptoms are related to immune suppression (and fevers) and sleep regression, both signs of disequilibrium in the body. And a growing brain is a HUNGRY brain. Even during equilibrium when children are not actively going through a growth spurt, a 5-year-old’s brain uses more glucose than an adult’s bigger brain. At age 4, the brain uses 43% of the body’s total energy expenditure! So, your usually regulated and balanced child is getting less quality sleep, needs more fuel for the body and brain, is more sensitive to their surroundings (hence easily overstimulated), and more emotional. We also know that children are going through these periods of equilibrium and disequilibrium when we look at the patterns of brain development. The peak of each of these colored lines indicates a period of intense growth in the areas of the brain associated with those skills. 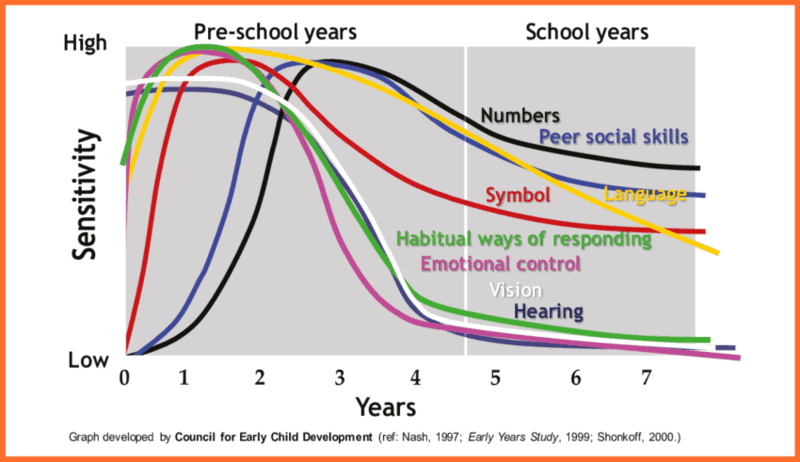 So, for example, we see intense growth in the brain in the area of peer social skills from ages 2.5 through 7. Growth in childhood may look different than we expect. Social angst and stress is not just a feeling or a behavior — but reflective of actual brain changes. So, when your 7-year-old comes home upset about a friend, this is part of the disequilibrium of that period. It is your child’s current challenge. Disequilibrium=Stress. And it’s our job as their parents to help them with that stress. Increased Hunger: asking for more snacks throughout the day, eating big meals, or skipping meals and wanting food before bed. Sleep Disruption: Having trouble settling down or waking in the night. Sleeping more: Having trouble waking up in the morning, falling asleep in the car, longer naps. Practicing a new skill: Doing sometime over and over. Everything from learning to stand, to learning to read. Clumsiness: It takes a little time for coordination and equilibrium to return after a period of sudden growth, so kids are more likely to run into doors, fall down, etc. Growing Pains: While pain at night can be many things (check with your Pediatrician), there are estimates that 1 in 3 children experience pains in their legs due to growth itself. The good news is twofold, first is that in a few weeks or so, your happy child will return and second, you can do a few things to ease the crankiness and support the brain during these periods of growth. Earlier than you think — before you would expect for your kids to be tired. 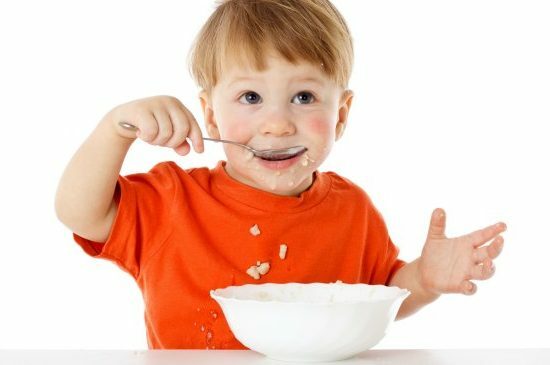 I am a huge fan of early bedtimes, in general (for more of the research behind the benefits of early bedtimes, read this) and when a cognitive leap hits, I aim for an even earlier bedtime. Studies show that the later kids go to sleep, the longer they take to get to sleep and the earlier they wake, the opposite of what the brain needs during this time. Start with increments of 20 minutes. If your child usually goes to sleep at 8:30, aim for 8:10. Give it a day or so and move to 7:50 and then 7:30. For tips on easing the transition to sleep read this. Research has shown that when children are sleeping, connections in the brain change. Some weaken (are trimmed) and some get stronger. In one night of sleep, connections between the right and left hemispheres can increase as much as 20%. What children practice and learn during the day, is solidified at night. Whenever my son shows signs of a growth spurt, I up the healthy snacks and healthy fats in his food. We often think our kids get plenty of fat– but are they getting the kind of healthy fats the brain is hungry for? The research on diet and brain is all over the place and I am not a nutritionist. But, several studies point to the importance of Omega 3s, antioxidants to protect the brain from self-generating free radicals, and iron. Of course, there are other studies which do not show the same effects. Here are a few links about nutrition and the brain if you are interested in reading further. When my son is going through a leap I give him an Omega-3 supplement. These are my favorites, a multi-vitamin with fish oil and a simple fish oil gummy. I like to vary which I give him, depending on what is on sale. Instead of the cheese crackers and raisins to tide him over until dinner, I stem the hangry attacks with snacks like avocado and fruit smoothies, oatmeal with flax seeds, banana, and nut butter rolled in a multi-grain tortilla, and refried beans and chips. If you kids will eat fish, pile on the salmon during these times too. I think that the pattern and tempo of music can calm the disorganization of the brain during these times. Of course, you don’t want to overdo it — but when your cranky child can’t handle sitting at dinner — turn on some tunes to distract their brain. Something low key, but interesting, that can capture their attention. 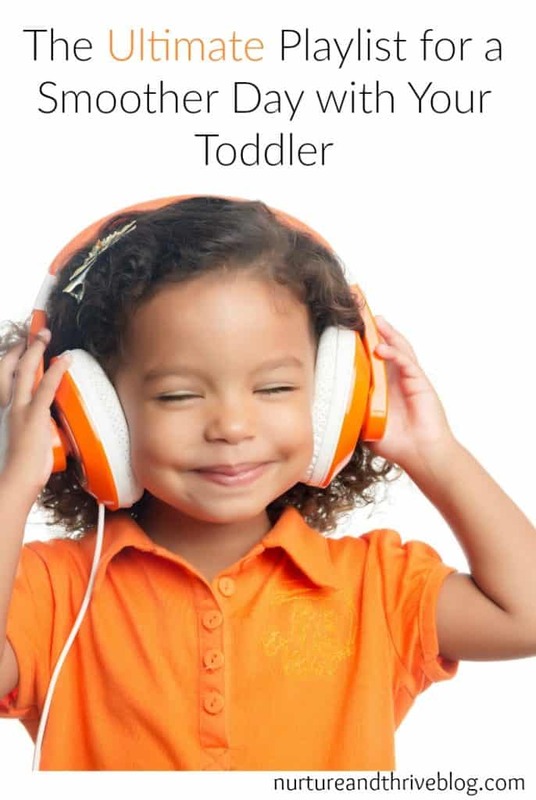 Here is my playlist for toddlers. This is also an awesome way to wake-up your child if they are super cranky in the morning. Create a playlist with a few of their favorite songs from movies. If all else fails, have a family dance party, a surefire way to reduce stress and get good endorphins flowing for the whole family. Being outside calms the mind, enhances learning and creativity, boosts mood, and can even increase kindness. It is my instant fix for a bad day. When kids are learning new skills a lot of time is spent concentrating. The perfect break from that kind of intense thinking is big motor movement. 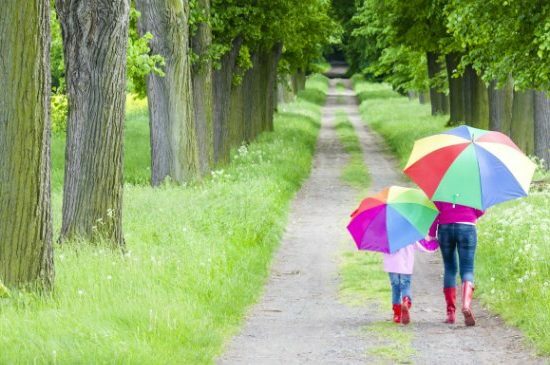 Running around, a walk on a trail, letting off steam at the playground — anything that gets them moving in a green space will help dispel their crankiness. There is also evidence that exercise stimulates brain growth, exactly how is still being researched, but there is pretty convincing evidence that outdoor exercise boosts children’s executive function. Executive functions like reasoning, planning, decision-making — are housed in the prefrontal cortex, which is developing across childhood. So, getting outside may have multiple benefits both directly and indirectly (lowers stress) on the developing brain. When they are babies it is easy to see what they need to have time practicing — crawling, standing, walking, vowel cooing, and so on. With older kids, the skill they are working on may not be as clear. But there are a few activities that will enhance many different kinds of skills. When my son hits a cognitive leap and is suddenly cranky I find that doing something with him that engages his mind will also calm him down. Some of the best activities that will calm a busy, active mind are sensory activities. During leaps, I might make a big batch of play dough or slime. Or gather some toys we don’t usually play with outside and take them in the sandbox. 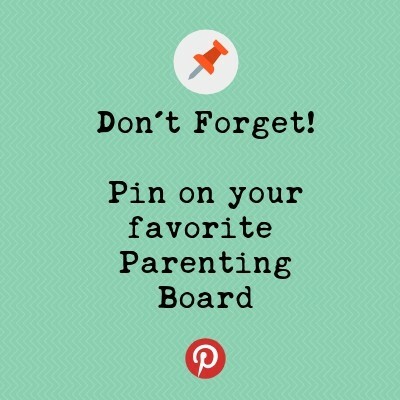 Activities that keep the hands busy, help soothe the over-active mind during big growth spurts. I pile up a bunch of books from the library near the breakfast table and around the house. These also help occupy growing minds. We also love playing games in our family and board games are so good for kids developing brains — they challenge kid’s impulse control, reasoning, attention and much more. Research shows hugs stimulate pressure receptors in our skin which leads to a cascade effect in the body resulting in a relaxed state. 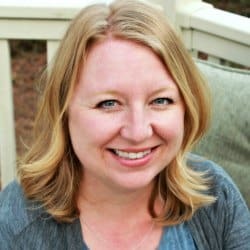 According to Dr. Tiffany Field, the pressure receptors stimulate the vagal system (e.g., state of relaxation), which in turn signals the brain to release oxytocin (the bonding hormone, e.g., the warm-fuzzies). 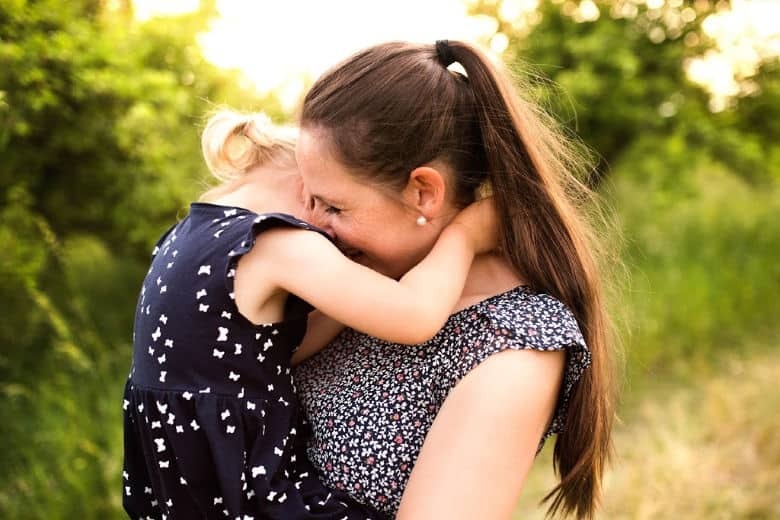 When your kids are having a hard time, give them a long 20-second hug, it will help buffer disequilibrium stress. Stretching and Yoga can have positive benefits for kids during growth spurts. First, Yoga and stretching can activate the parasympathetic system, the rest and digest system. This is the opposite of the sympathetic or stress system. So, this kind of bodywork can buffer some of the stress of a period of disequilibrium. Second, if your child is having musculoskeletal growth, gentle stretching before bed can help decrease growing pains. Kids can have really tight calves and hamstrings, partially due to bones growing faster than muscles. These are a few of the stretches my pediatrician recommended for my son during growth spurts. Now that you know what to look for and how to help your child’s growing brain, I hope some of the periods of disequilibrium will be a little smoother in your house. Find more of my articles and resources for parents below. Really interesting read Ashley – I hadn’t thought about the whole fats thing when they’re going through growth spurts but makes sense. Very informative. I appreciate your clear way of communicating on a complex topic . I also appreciate the suggestions of ways to help the child.. I have signed up for your newsletter. Thanks for the information about children’s developing brains! I found the cognitive leaps to be particularly interesting, and it is so apparent that development is never linear or steady. Thanks again! Thank you and thanks for leaving some feedback. I do love the concept of development happening in leaps and bounds rather than at a linear and steady pace. Thanks Ashley, I’m relieved, my lo has just turned one and these days is being really difficult. It helps to know why he does this. Thank you! I always say if things continue unexpectedly it’s always a good idea to check in with you pediatrician to rule out other possibilities. This was in my inbox this morning after a very long and disregulated weekend. It was just what I needed! I have been trying to figure out why my kid is over the top cranky lately. She is totally learning to read and is working on different sounds a lot. She is also working on numbers and learning to add them together. Her brain is working extra hard right now and I really need to give her a break about it sometimes. I have found myself picking her up from her stomping on the bed or whatever she’s been asked not to do and just hugging her. Singing songs together has helped the morning routine go more smoothly. Not expecting so much from her at pre-k drop off has been helping too! I’m wondering if some of these cognitive leaps take longer than others. Like reading. It takes so long to learn to read and understand all of the sounds. Couldn’t that take weeks for the brain to process, and mean a much longer period of crankiness? Thanks for the the ideas on how to fuel her brain better. I needed that today!